This quick review was provided by Gillian, whose daughter is allergic to dairy and egg. 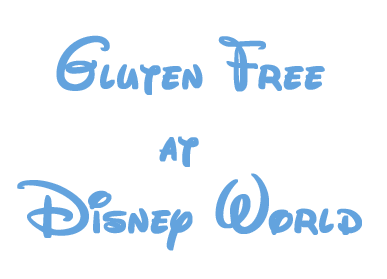 Read her full Disney World food allergy trip report here. The manager asked the age of my daughter and then said she could only have the items from the CHILDREN’S meal that were safe for her. No hamburger. I had to wait 20 minutes to see a manager, then an additional 20 minutes for allergy safe hotdog and the rest of the party’s food. The kid behind the counter kept saying to me (although I never asked him any questions)…”if you gonna order an allergy meal, your gonna have to wait.” I didn’t mind waiting, I just felt awkward being made to feel like I was the cause of everyone behind me also waiting. 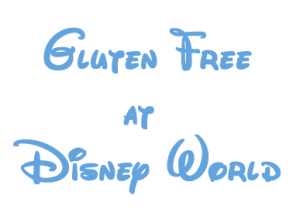 Read the full Disney World food allergy trip report here. If you would like to review Cosmic Ray’s or any Disney restaurant, submit a food allergy dining Quick Review. This was our first experience ordering food at a Magic Kingdom restaurant. We spoke to a manager about our 3-year-old son’s food allergies and she said that they could make him a safe hamburger, french fries, and cookies. We waited while the staff prepared the food for our family. I noticed that my son was given a cheeseburger instead of a hamburger (which is what we had ordered). The employee seemed confused and I explained to him that my son has a milk allergy and can not have cheese. He said that they would prepare him a new hamburger and it was ready a few minutes later. My 6-year-old son started eating a cookie when we sat down. I thought that it was the cookie that my 3-year-old ordered. My husband started to give my 3-year-old the other half of the cookie, but I had a bag of safe cookies in my son’s backpack that I gave him as a substitute. I looked at the label on the cookie package and it contained wheat and eggs! Apparently, we were given the standard cookie instead of the allergy friendly cookie! I talked to a different manager who was concerned and repeatedly asked if my food allergic son ate any of the cookies and I reassured her that he had not. She went to the back and got us 2 packages of Enjoy Life cookies. She said that she was going to immediately report the problem to the kitchen staff. An important lesson that I learned was that the safe cookies at Walt Disney World are always the Enjoy Life cookies, so if you receive anything else, double-check the ingredients! 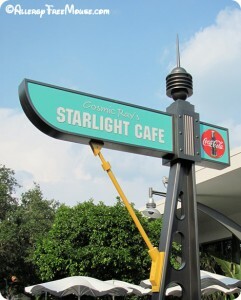 If you would like to review Cosmic Ray’s Starlight Cafe or any Disney restaurant, submit a food allergy dining Quick Review. This Disney food allergy review is from Ted, who has a milk allergy in his family. 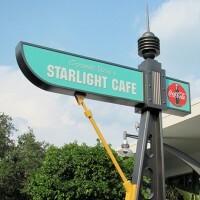 My wife and I dined at Cosmic Ray’s Starlight Cafe at the Magic Kingdom Park in Disney World. This place was our second favorite place to dine at any of the Disney World theme parks. The chefs came out and talked to us, and asked what we wanted. We were dining with a milk allergy, so they showed us our options. We chose the 1/2 rotisserie chicken with two sides of french fries. I believe the meal we ordered usually comes with 1/2 chicken, french fries, and a side of green beans. However, we did not select the green beans and instead chose two sides of french fries. We split the meal between both of us, and it was plenty of food and tasted great. 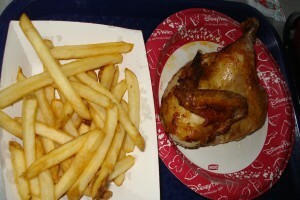 Although the french fries may not be the healthiest choice, the chicken seemed healthy and tasted great. We dined here during the second week of May 2012. Both times we dined here, the chefs were wonderful and brought our meal to us himself. I would suggest bringing many snacks for your trip because many of the quick-service meals at WDW offer very similar options, so it is nice to have snacks. They do sell some allergy-friendly snacks/treats around the park. We saw Enjoy Life chocolate bars and Surf Sweet’s gummies around the park. We had a wonderful trip, and I would suggest trying Cosmic Ray’s Starlight Cafe to anyone dining with food allergies.